Lower income kids need Facebook more than wealthier kids: it provides access to people, information and services for which the affluent have broader, faster and more convenient sources. The less wealthy are accustomed to surveillance so are not bothered by revelations regarding loss of personal privacy, which is rare in their lives anyway. The share of teens who use Facebook fell by 20% points over three years. Kids across all income brackets have much the same access to smartphones. A similar share of teens across income levels use Instagram, Snapchat and YouTube. Lower-income kids use technology to help them filling gaps when other resources are unavailable. They use Facebook to keep in touch with their networks, to find support, and to get ahead. Trend-watchers, analysts, and the media, have said that teenagers have shunned Facebook, in favor of finstas, Snapchat streaks, and YouTube fandoms. And this is largely true. According to the Pew Research Center, the share of teens who use Facebook fell by 20 percentage points over three years. Now, only about half of US teens use Facebook, compared to nearly two-thirds of adults. Some surveys say it’s even less. But Alexus isn’t alone on Facebook. Looking more closely at demographics, a clear division emerges: While only one-third of kids from families with higher incomes said they are on Facebook, Pew reported recently, a much larger share of teens from lower-income backgrounds, like Alexus, said that they still use the platform. 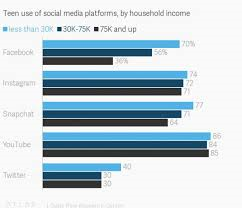 When Pew last surveyed teenagers—three years ago—lower-income kids reported that they used Instagram and Snapchat much less than they currently do. It’s easy to speculate why: Instagram was still known as the platform where seemingly rich kids show off their private jets and exotic vacations, and Snapchat used up a lot of data. Both were apps created for smartphones, which were less ubiquitous among low-income kids. But today, as Instagram has grown in popularity and access to smartphones and mobile data has increased, a similar share of teens across all income levels use Instagram, Snapchat and YouTube. The only significant difference comes in how they use of Facebook. Why? There’s no simple answer to this question, but there are several compelling theories. Most of them have to do with resilience, where lower-income kids use technology to help them in various ways, filling gaps when other resources are unavailable. They use Facebook to keep in touch with their networks, to find support, and to get ahead. Quartz spoke with communications experts who offered some answers, stemming from their work with low-income teenagers from various backgrounds, including immigrant children or those in foster care. The stories of several lower-income teens that Quartz spoke to aligned with the experts’ experiences (the teens were contacted through an organization in Rochester, New York, that helps get young people involved in their community and in social causes). According to the National Center for Children in Poverty, as many as 9.4 million US children aged 12-17 live in low-income households. That’s about 39% of all US adolescents. The Pew study showed that kids across all income brackets have pretty much the same access to smartphones. It’s likely, however, that the level of access may be different: lower-income kids tend to share devices more often, or have older hand-me-down phones, Jacqueline Vickery, an associate professor in the media arts department at the University of North Texas, told Quartz. They might also have more limited data plans, leaving them to rely more on wifi. On Instagram and Snapchat, everyone is obsessive in the same way. “I mainly use [Instagram] to just post pictures of myself. Trying to get a lot of likes and whatnot 😭,” Alianna, 15, of Rochester, New York, said in a text. Her mother works part-time in retail while the mother’s partner works for a package delivery service. We’ve seen a class division in social media play out before. Facebook was founded at an elite institution, Harvard, and was initially limited only to Boston and Ivy League universities. In its early years, the teenagers that generally flocked to Facebook were privileged and wealthy. They were escaping MySpace, the music-focused platform that was popular in the mid-2000s. Sociologist danah boyd (she prefers her name in all lowercase letters) has even called the early shift from one platform to the other “white flight,” comparing it to whites leaving city neighborhoods for the suburbs, a phenomenon that started roughly in the middle of the 20th century. In the end, the most important indicator of where teenagers go is simply where there friends are. “Because of its origins, some saw Facebook as an elite social network site. The ‘highbrow’ aura of Facebook appealed to some potential participants, while repelling others,” boyd wrote in 2011, in a study for which she interviewed and observed students in 17 different states and analyzed 10,000 social media profiles. Class and race were clearly linked to the students’ perceptions of both platforms. While Facebook may have felt exclusionary in its early days, MySpace remained a platform where young people of color felt like they belonged, Lynn Schofield Clark, a professor in the media, film, and journalism department at the University of Denver, told Quartz. In the end, the most important indicator of where teenagers go is simply where there friends are. Today, Facebook is not a particularly “elite” social network, and it’s hard to imagine a time when it was seen as one. Instead, it’s become more of a public utility, and those who need it, take advantage. Clark told Quartz that among the low-income teens she works with, she has observed a drop-off in the number of kids who say they are still on Facebook. The platform has lost its cultural cachet for many young people. But, she says, even if they don’t want to use it, many still see it as a necessity. There’s less of a generational gap among lower-income communities, Clark argued. “Sometimes there’s support that can be found from your aunts, uncles, and parents,” she said. Low-income teens might want to distance themselves from their parents just as much as their peers, but “there’s also a way in which parents are seen as part of a larger social circle that can be protective of them,” she added. People with lower incomes also tend to move more. Alexus, mentioned in the beginning of the story, has often relocated, and uses Facebook as a line to the friends and family she left behind. “We’ve [also] seen this in foster care,” Vickery said. “Facebook is still kind of a more universal platform that connects [teens] to adults, to people that aren’t in their day-to-day lives.” Vickery worked with kids who bounce back-and-forth between grandparents, parents, and friends for housing. When a teen’s life is transient, Facebook becomes a connector with older siblings, cousins, aunts, uncles; the glue between separated kin. The teens Quartz spoke to use Facebook less for absent-minded scrolling than for specific purposes. Facebook’s event-creating feature is one of its more powerful tools for organizing around social causes—and, where they see injustice, teens protest. “Snapchat or Instagram aren’t really set up to facilitate group activism in the same way,” Vickery said. Facebook has a better infrastructure, there’s less social pressure than reaching out to someone directly. While Alianna says she goes on Snapchat and Instagram when she’s bored or not doing anything, she uses Facebook more intentionally. “I don’t use Facebook very often, I mainly use it for networking,” she said. On the platform, she’s connected to various people at a local university where she is a member of a group that performs in sign language, she told Quartz. Erik, 18, uses Facebook as an entrepreneur. He checks in four to six times a day to promote his budding photography business, “and to see what the latest trends and fashions are” (he uses Instagram in a similar fashion). His father is a mechanic and fitness trainer and mother works for a cable company. The less-affluent teens Vickery has worked with in the past used Facebook to communicate with other adults in their lives—their coach, the drama club organizer, or youth group leaders in church. “If you think of it in a social capital perspective, high-income kids have access to a lot of resources and social capital that low income kids often have to work differently to gain access to,” she said. Online networks can be one way of expanding this access, where, for example, there’s less opportunity for face-to-face interaction, or less individualized attention (like in classrooms). Because marginalized teens are generally more skeptical of institutions, they try to find support through their own networks, Clark said. She said she frequently sees young people ask or offer homework help on Facebook. One of the urban high schools she worked in launched an effort to enroll more students in honors classes: The organizers used Facebook to get in touch with them, she said. Using Facebook as a homework aide can be useful where parents are very busy, working multiple jobs, or if they have language challenges, she added. On the other hand, low-income kids generally participate in extracurricular activities at lower levels than their higher-income peers, and they spend, on average, more time engaged with screens. Less structured time could mean more time to spend online. Less affluent teens often rely on public transit, Clark noted. “In wealthy families you see parents trying to orchestrate conversation when you’re in the carpool,” she said. “With lower-income young people, they are on their own a lot more because their parents work different shifts,” she added. “There’s a lot more waiting around, so that’s where social media fills that gap.” Facebook becomes another app to spend your free time on. It does also offer several different things to do, such as checking out groups or clicking on the links that friends share. A 2015 Pew Research Center survey also found that higher-income teens hang out with their close friends in person at a higher rate than kids from low-income households. The researchers Quartz spoke with both noted one key thing in how they’ve seen low income teenagers use social media: concern for security. Clark said the college students she works with, who tend to be more affluent, were surprised by the Cambridge Analytica revelations, and some even left the platform as a result. But the response from kids she works with in urban high schools was more of a shrug: “Of course they are surveilling us, we are surveilled all the time, we’re constantly under watch so why would we expect anything different from Facebook?” she said, paraphrasing her students. This anxiety may be a reason in itself for why low-income teens still use Facebook. One strategy they use to protect themselves online is to diversify their social media accounts, Vickery said. They might use the disappearing messages of Snapchat to communicate with friends: Twitter for information about pop culture, or news; and Facebook to talk to family or other adults. Vickery said kids will intentionally keep their profiles separate, with different user names. They won’t link one to the other. “By using these different accounts to connect with different networks and to gain different information, they are also managing their identities differently in these different spaces,” she added. More privileged teens might have a more lax approach. On one platform they might behave like a normal 14-year-old, while on another they might be more passive, “presenting what they perceive as an ‘appropriate’ version of themselves,” said Vickery. They will use different language, and be careful not to reveal too much—a form of digital “code-switching,” which is when people switch languages or ways of speaking depending on the situation. Using Facebook is a survival approach. Facebook did not have much to say about the income disparity in Pew’s research. A spokesperson said it was one of several studies that showed the advantage of a free, ad-based service. And it’s not that Facebook is doing anything in particular to retain these teenagers, who have, in fact, been skeptical of the platform for a longer time than their wealthier counterparts, Clark said.